Simply put, there is nothing like fresh, local seafood. Spending a month in Maine has allowed us to get to know the fishermen and women, as well as the fishmongers, and sample all of their amazing Atlantic catches. We’ve sampled a few lobster and crab rolls, as well as fresh haddock sandwiches, but we don’t go out much, because we love to cook and eat at home. So, of course, all things pointed to my making fresh versions of our favorite Maine fare in the Wordcampmer. We began with the crab roll. The favorite lobster and crab roll shops around town are famous and rightly so: Everything they make is fresh and fast and delicious. However, they are made with lots of mayonnaise. Sometimes that’s okay with me, but it is rarely okay with Scot, even if I make homemade mayo/aioli, it doesn’t cut it. It’s an egg thing, or a gelatinous thing, if it comes in a jar. I understand and it’s okay. Most food items that include mayonnaise-y consistency will not sit well with Scot, so I create something new. Often what I use instead is plain Greek yogurt, which I enjoy more as well. In any sort of sandwich “salad” — tuna salad, egg salad and so on — I use Greek yogurt. 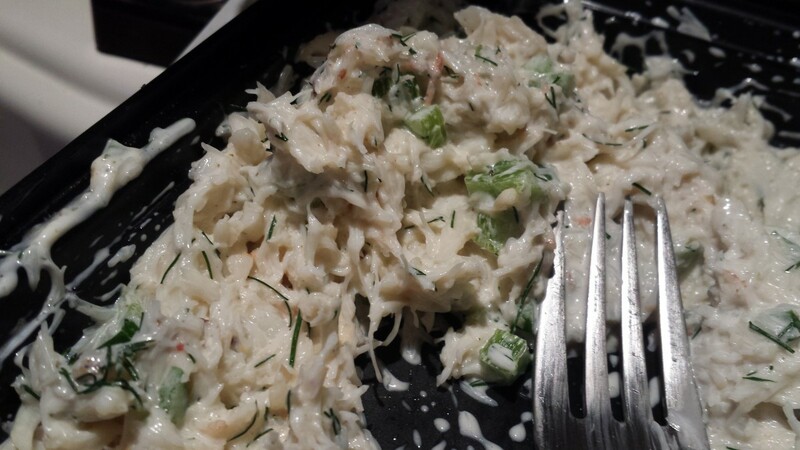 It is quite delicious and offers a fresher, lighter taste than regular old mayo. 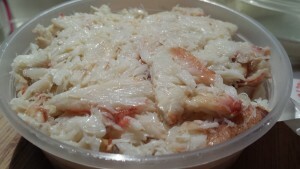 I didn’t hesitate to use it in my crab roll recipe. 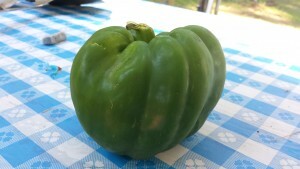 Furthermore, there is so much fresh, local produce around that I played with that, too. Typically, crab or lobster rolls include celery and celery salt. Although Scot likes celery salt, I do not. Instead, I found that giant Maine green peppers, green cabbage and fresh, local dill worked like magic with fresh crab meat. 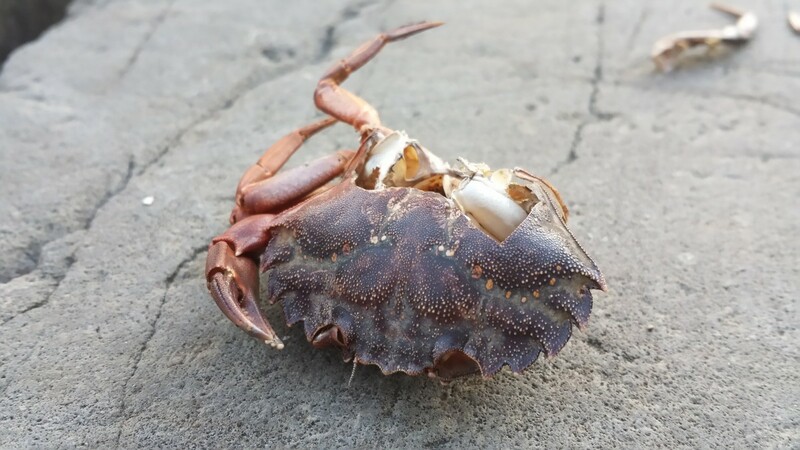 We feel that the flavor of the crab should speak for itself, as well as not taint the efforts made by local fishermen and women. They are out to catch fish and crustaceans, which taste so good on their own. Why mess with a good thing? In a small bowl, combine all ingredients. Sample and adjust to your liking. If you have time, let the mixture rest in the refrigerator for about a half hour. 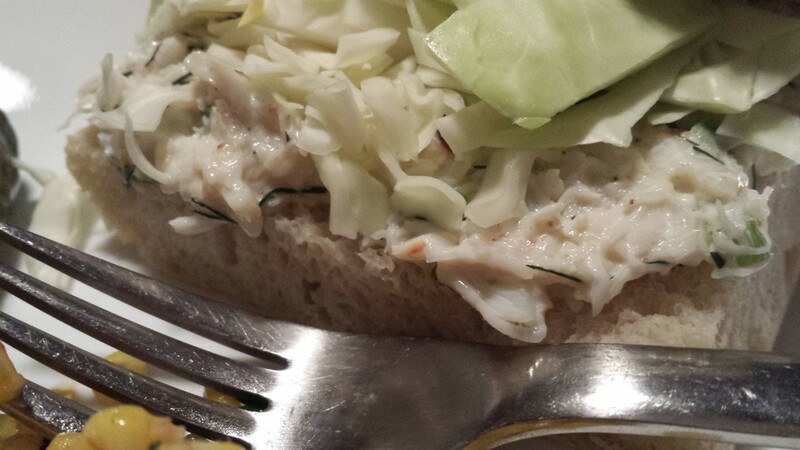 Place a large scoopful of delicious crab mixture into your bread and eat it. Perhaps a little hot sauce might be nice. I agree with Scot…mayo is out, something lighter (yogurt) is in!